Are you looking for a suitable moving company for your move to or from Berlin? Then you found a professional moving company in Berlin as us. We are carrying out moving services throughout Germany and Europe. We are happy to support you in your move from Berlin to Düsseldorf or from Düsseldorf to Berlin. After you have been in contact with us, we will explain how your move will take place and start a detailed planning with you. You can also stay completely out by using our full service. In this case, you can put your move in our hands in a way that is very salentfully. From packing your moving boxes to disposal and dismantling to renovating, we’ll take care of everything for you, so you can realx and take care of more important things. In addition, we apply for stop ban zones, can take over the dismantling and assembly of furniture and, of course, provide you with moving material. We are an experienced team that is perfectly capable of a complete move from Berlin to Düsseldorf or even a move from Düsseldorf to Berlin, independently and without any problems to implement. With us, you can quickly and easily receive an individual relocation offer. For a rough overview of the costs, you can first obtain a non-binding offer from us. A move is much more than just a small change of place of residence. Moves are associated with a whole new stage of life. Eventually, you leave your usual surroundings. In addition to all the joy, a move is also associated with a lot of stress and rarely proceeds without any problems. To prevent this, we are here for you. We are a professional moving company that, because of its years of experience, knows exactly what to do, so that a move goes for you without any problems and stress. A move that changes the city is no longer a challenge for us. Whether it’s a private or office move, you can always count on us! Where do you want to move to? 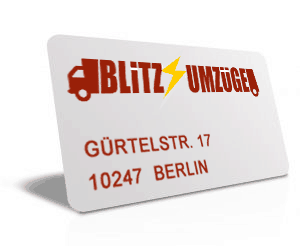 Blitz Movers Berlin is a moving company in Berlin that successfully implements moving services throughout Germany and Europe. If you have any questions or concerns about your move, do not hesitate to contact us – we will be happy to help!